One of East Africa’s best-known poets, p’Bitek helped redefine African literature by emphasizing the oral tradition of the native Acholi people of Uganda. His lengthy prose poems, often categorized as poetic novels, reflect the form of traditional Acholi songs while expressing contemporary political and social themes. p’Bitek’s respect for ancestral art forms began during his childhood in Gulu, Uganda, where his father, a school teacher, was an expressive storyteller, and his mother was considered a great singer of Acholi songs. An outstanding student, p’Bitek composed and produced a full-length opera while still in high school. At twenty-two he published his first literary work, a novel in the Acholi language entitled Lak tar miyo kinyero wi lobo? (White Teeth; 1953). After studying at King’s College in Budo, p’Bitek played on Uganda’s national soccer team while maintaining a position as a high school teacher. In the summer of 1956 he participated in the Olympic Games in London and remained in England to study at several institutions, including the Institute of Social Anthropology in Oxford and University College, Wales. He was first recognized as a major voice in African literature in 1966 when he publishedSong of Lawino. In the same year he was named director of the Uganda National Theater and Cultural Center. In this capacity he founded the highly successful Gulu Arts Festival, which celebrates the traditional oral history, dance, and other arts of the Acholi people. Political pressures, however, forced p’Bitek from his directorship after two years. He moved to Kenya, where, with the exception of frequent visits to universities in the United States, he remained throughout the reign of Ugandan dictator Idi Amin. After founding the Kisumu Arts Festival in Kenya and later serving as a professor in Nigeria, p’Bitek eventually returned to Makerere University in Kampala, Uganda, where he was professor of creative writing until his death in 1982.
p’Bitek’s most famous work, Song of Lawino,is a plea for the protection of Acholi cultural tradition from the encroachment of Western influences. The prose poem is narrated by Lawino, an illiterate Ugandan housewife, who complains bitterly that her university-educated husband, Ocol, has rejected her and his own Acholi heritage in favor of a more modern lifestyle. Perceiving his wife as an undesirable impediment to his progress, Ocol devotes his attention to Clementine (Tina), his Westernized mistress. Throughout the work, Lawino condemns her husband’s disdain for African ways, describing her native civilization as beautiful, meaningful, and deeply satisfying: “Listen Ocol, my old friend, / The ways of your ancestors / Are good, / Their customs are solid / And not hollow. …” She laments her husband’s disrespect for his own culture and questions the logic of many Western customs: “At the height of the hot season / The progressive and civilized ones / Put on blanket suits / And woollen socks from Europe. …” In Song of Ocol (1970) Lawino’s husband responds to her worries, expressing his disgust for African ways and the destructive force of his self-hatred: “Smash all these mirrors / That I may not see / The blackness of the past / From which I came / Reflected in them.” Rather than reflecting the superiority of Western civilization, Ocol’s voice has been characterized as an enraged, violent outpouring against Africa and African culture. 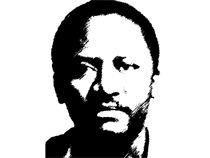 p’Bitek’s next major work, Two Songs (1971), won the Kenya Publishers Association’s Jomo Kenyatta Prize in 1972. Widely praised for its political significance, Song of Prisonerdescribes the anguish of a convicted criminal as he suffers from depression, delusions, and claustrophobia. The specific nature of the prisoner’s crime remains unclear; he first claims that he was arrested for loitering in the park but later asserts that he has assassinated a political leader whom he describes as “a murderer / A racist / A tribalist / A clanist / A brotherist.” Although he frequently presents himself as a hero, the ambiguous narrator also reveals intense feelings of impotence and anxiety: “I am an insect / Trapped between the toes / Of a bull elephant.” Song of Malaya, on the other hand, is narrated by a prostitute (“malaya” translates loosely to “whore”) whose strength and stable personality prevail as she exposes the hypocrisy of those who condemn her. Several critics have interpreted the narrator’s voice as a symbol of tolerance for human diversity. In his later years p’Bitek focused on translating African literature, and in 1974 he published The Horn of My Love, a collection of Acholi folk songs about death, ancient Acholi chiefs, love, and courtship. Hare and Hornbill(1978) is a collection of folk tales presenting both humans and animals as characters. Praising p’Bitek’s translation of The Horn of My Love,Gerald Moore commented that anyone “familiar with [p’Bitek’s] own poetry, especially Song of Lawino, will recognize here the indigenous poetic tradition in which that fine work is embedded.” In 1989 p’Bitek’s first published work, a novel entitled Lak tar miyo kinyero wi lobo? (Are Your Teeth White? Then Laugh! ), was published in English for the first time as White Teeth.